Here’s a great deal on a quality Gradient Lens Corp. Borescope. Sinclair Int’l offers a special $560.00 Limited Edition Hawkeye model, designed for shooters and gunsmiths. This 17″ borescope, Sinclair item #HS17, includes the same light source, mirror adaptor, and cleaning kit as the regular Hawkeye #HS17FE-K. You don’t get a focusing eyepiece with the Limited Edition but focus is pre-set for 22 through 30-caliber barrels, so that’s not a problem. The same model with focusing eyepiece (item HS17FE-K) costs $775.00 ($660.00 after manufacturer’s rebate*). The Limited Edition Hawkeye is shipped in a padded, cardboard case and can be disassembled in seconds with included Allen wrench. Savings are passed on to shooters with the omission of the focusing eyepiece and hardcase. The more expensive model comes with a deluxe, lockable aluminum hardcase. 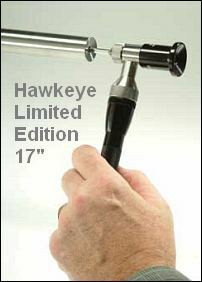 *Rebate offer: A rebate of $75.00 is available on the Hawkeye 17 Borescope Kit (HS17FE-K ONLY). Mail your Sinclair International Invoice directly to Gradient Lens before July 1, 2007. Rebate valid for United States customers ONLY. NO REBATE on Limited Edition. Share the post "$560 Limited Edition Borescope"